Thar’s gold in them thar hills!! Not the precious metal type of gold, but the horticultural kind you can find in Helenium ‘Dakota Gold’. 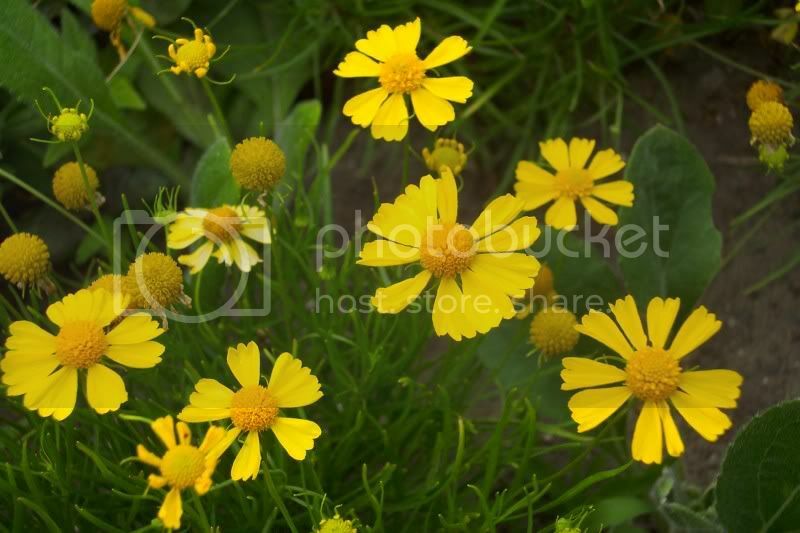 Helenium is the genus name for a grouping of plants that includes Sneezeweed. Many of these species and varieties are tall, often growing over four feet in height and having large orangish flowers. Dakota Gold grows only about a foot tall and about a foot and a half in width. It’s growth habit makes it ideal for planting in the front of a bed. 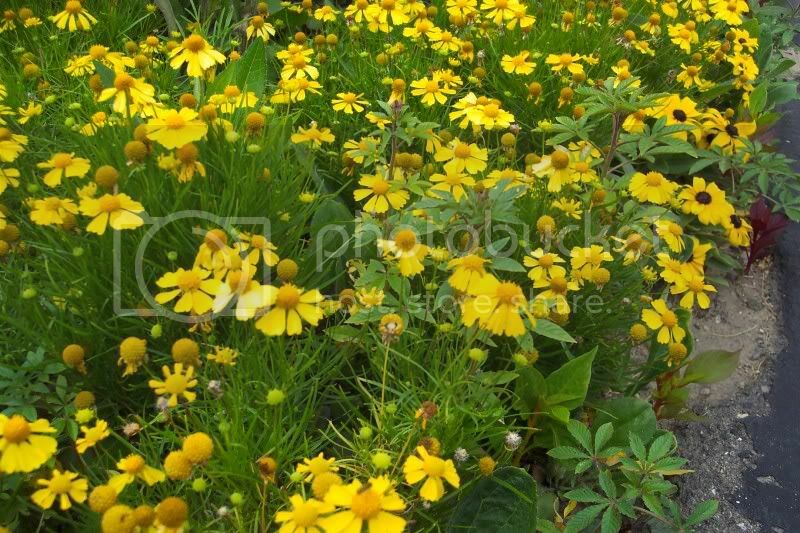 It also produces an abundance of dainty, bright golden yellow flowers. I used it in a spot where I wanted a swath of yellow but didn’t want to use something over-powering like Marigolds. A single plant of Dakota Gold, or a planting of just a few, would not be very impressive, but plant a good sized drift of them and they suddenly become something special. As far as I know, last year was the first year Dakota Gold seed was widely available. We should be seeing more and more Helenium Dakota Gold being made available in garden centers in the future as more gardeners discover this wonderful little plant. …and that’s nothing to sneeze at! 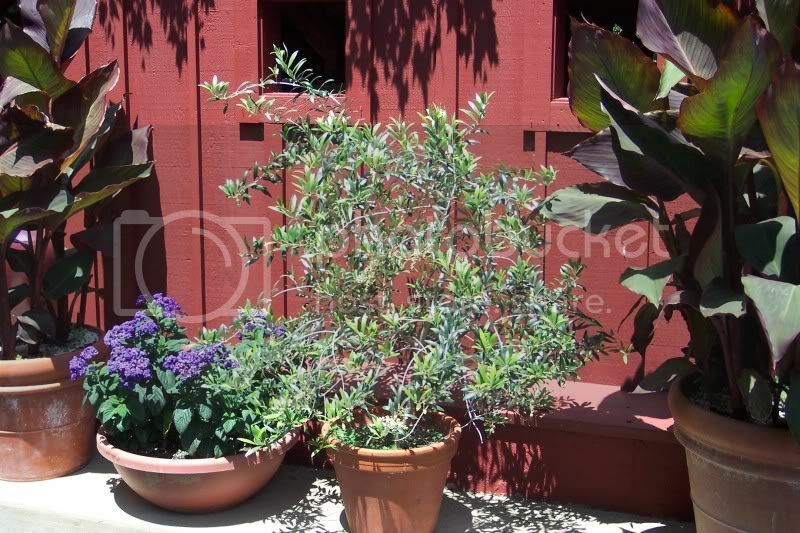 One of my favorite potted plants is our Olive Tree. We have two of these trees in pots and they seem to be quite happy living in their containers. They don’t have big showy flowers or give off a sweet scent. What I like is their graceful form. The branches grow in sweeping curves that support delicate silvery-green leaves that compliment surrounding plants. Olive leaves also make a refreshing tea which I drink from time to time. Our Olive Trees are about five years old and are nearly three feet tall in the pots and do produce actual olives. They have to be over wintered indoors because they are not hardy enough to withstand our winters. You can just bring them into a dimly lit, cool storage area (45F-55F) when the autumn temperatures start to fall and reduce watering to a minimum. Or, keep them going all winter in your greenhouse, they’re not all that picky. 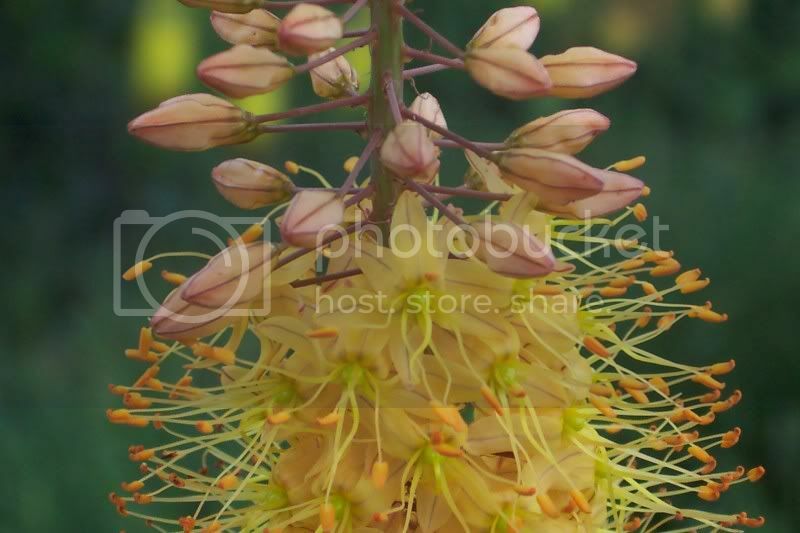 This time of the year it is always a treat to see the Eremurus blooming. Because we have them planted in an area under the walnut trees where not much else is growing, they seem to shoot up out of nowhere. As you may or may not know, it is nearly impossible to grow most plants under Black Walnut trees, but the Eremurus seems to live there just fine. These plants are native to Tibet where the summers are hot and dry but have good fall and spring rainfall. This often describes the weather in this part of the country as well. It’s no wonder that Foxtail Lilies do well here. 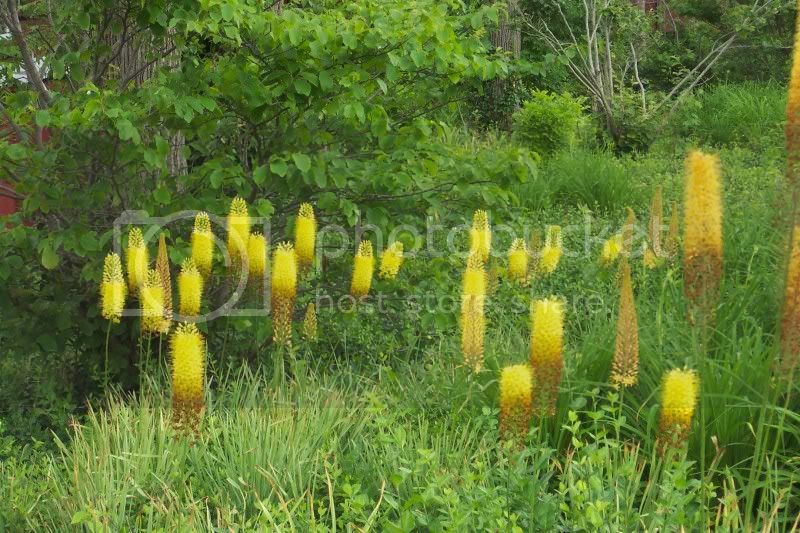 Our Eremurus are the yellow variety (bungei) and range from 3 to 4 feet tall. From a distance, the hundreds of tiny flowers on the stalk merge together to give them their unique look. It’s when you get closer that the individual flowers become apparent. Foxtail Lilies are grown from tuberous roots that in themselves have a unique shape, they sort of remind me of star fish. Fall is the time when the roots are planted, so you have some time to track some down and get them ordered. We got ours from K. van Bourgondien and Sons (dutchbulbs.com). There is one thing I would recommend when planting your Foxtail Lily this fall, and that is to mulch them well. They are a little weak getting started the first fall. However, after that, they thrive here in southern Michigan. 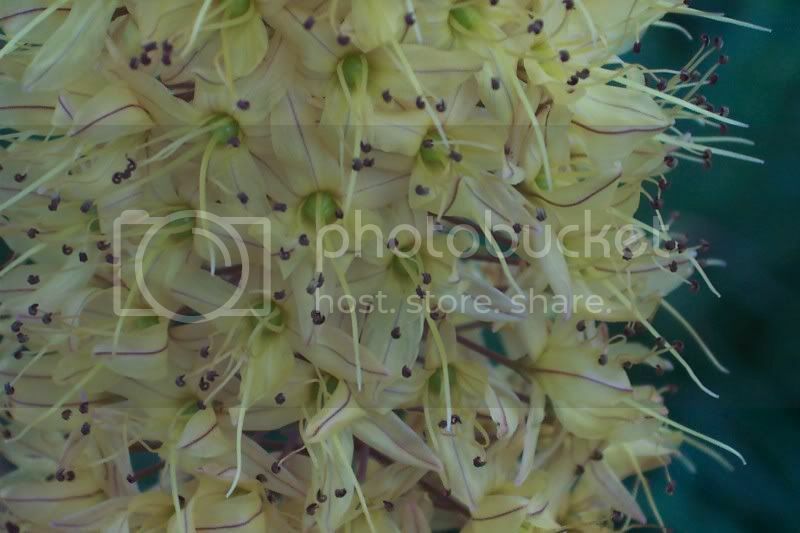 So, put Eremurus on your fall ” must-buy list”.